Cheikhou Kouyate’s weekend catching of Manchester City star David Silva may be the freshest elbowing incident in the minds of football fans but it is by no means the worst. 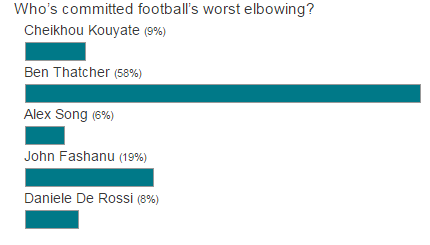 That is according to the latest Ladbrokes News poll, which found that former Citizens player Ben Thatcher’s infamous forearm smash on then-Portsmouth star Pedro Mendes is football’s worst elbow crime. Thatcher picked up a whopping 58 per cent of the total vote for the incident which earned his an eight game ban from the FA and a six-week wage fine from the City board. Wimbledon battler John Fashanu came second in the voting after the sharp end of his elbow caused considerable damage to the eye of Spurs hero Gary Mabbutt, earning the former Gladiators presenter 19 per cent of our vote. Kouyate rounded out the top three, but with replays showing that the Senegal star may have caught Silva by accident, the Hammers star picked up just nine per cent of the poll’s responses. Italian Daniele De Rossi was fourth with eight per cent for a smash that left US striker Brian McBride bruised and bloodied at the 2006 World Cup. It seems the Azzurri man’s willingness to hold his hands up and apologise immediately after the game has earned him a reprieve of sorts. And rounding off the voting was Kouyate’s West Ham team-mate Alex Song, with the Cameroon star’s weird back elbow on Mario Mandzukic earning just six per cent of the votes.